In just a few weeks, “Force Friday II” begins—which means the first wave of toys based on Star Wars: The Last Jedi will hit shelves. Inevitably, that means people will start ruthlessly inspecting every toy they can find, hoping to decode clues about Episode VIII. But as you’ll see, movie merch is rarely a reliable source of secret movie spoilers. Lex Luthor’s Green-and-Purple powersuit is one of his most iconic looks from the comics, the tech he uses to directly go toe to toe with Superman time and time again. So with Lex making his DCEU debut in Batman v Superman, rumors swirled that the armor would play a role in the movie. I mean, you had armored Batman, why not armored Lex, too? 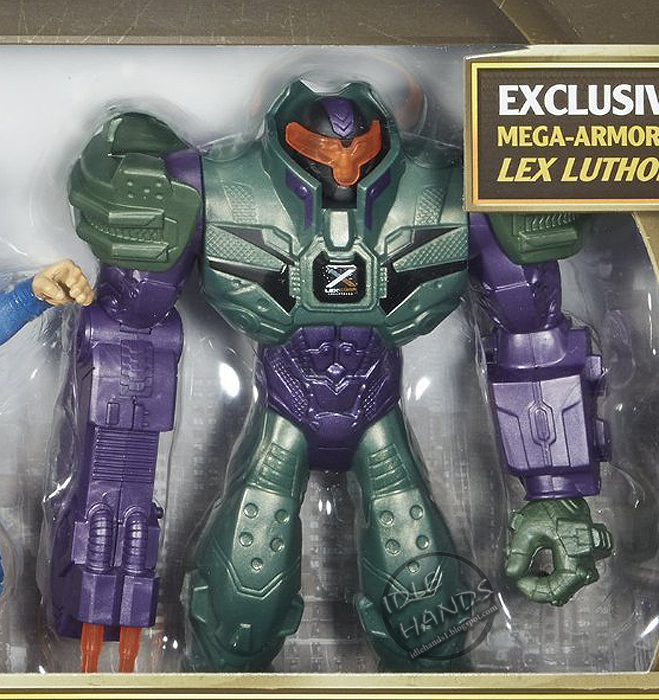 The rumors reached fever pitch however thanks to Batman v Superman’s toyline, which included figures of Lex both in a normal suit of armor and a “mega version” that basically turned him into a cartoony, green-and-purple Hulkbuster. Suddenly, it was confirmed Lex woud suit up and do battle in the movie... but he didn’t. It was just a toy made for the toyline so your army of good-guy action figures would have someone to be smashed against. Perhaps the most infamous example of why you should never be quick to trust a spoiler based on movie toys, fans freaked out ahead of Iron Man 3's arrival thanks to Lego’s line of sets based on the movie. Intense boat chases! Pepper Potts in the Iron Man suit! The Mandarin in... a flamethrower golf cart? Yes, really. The smallest set in the Lego sries “based” on the movie, Iron Man vs The Mandarin: Ultimate Showdown featured two minifigures—Iron Man and the Mandarin, obviously—as well as the most ridiculous little buggy for the Mandarin to drive around in, complete with a hilariously over-complicated flamethrower device. Had Lego just completely spoiled an incredibly weird finale to the movie? No, because not only was the Mandarin of the movie very different from what fans were expecting, he didn’t have a bizarro golf cart at all. Shame, really. Even we fell for this one! Hot Toys, the fine makes of insanely detailed figures from your favorite movies, freaked everyone out at San Diego Comic-Con last year when the company nonchalantly revealed the latest figure in their Suicide Squad line: the Joker, dressed up in a tattered, graffiti-covered version of Ben Affleck’s batsuit. What could it it mean!? What were the Joker’s plans in the movie!? Would this all lead to something incredibly crazy and awesome? Lego strikes back with another set that had everyone talking—because not only did this set feature Scott Lang’s Ant-Man, but an Ant-Man in a darker-colored suit marked as Henry “Hank” Pym, i.e. the original Ant-Man. So naturally, everyone was expecting the final battle of the movie to see the retired Hank suit up in his own version of the Ant-Man get-up and help Scott take on Yellowjacket. That never happened, but Hank did actually suit up in the film, in the form of flashbacks to his own time as a size-altering superhero. So Lego’s set ended up being a weird half-truth... just not in the way most people expected. One of the most persistent rumors about The Force Awakens that never panned out was the idea of the New Republic and the First Order would both have competing superweapons that added some moral gray areas to their conflict. At one point, there were even rumors that Domnhall Gleeson’s General Hux was actually a former Resistance member who defected because of the creation of a destructive weapon by the heroes, on a secret mission to destroy the superweapons of both sides! The rumor began to subside as The Force Awakens drew nearer, but then flared up again when Disney nonchalantly announced details about a movie tie-in for its “toys-to-life” video game series Disney Infinity. One of the included “power up discs” for the film’s level in the game was a “Resistance Tactical Strike”, depicted as a very Death-Dtar-looking laser blast exploding a chunk of a planet—leading to renewed speculation that the good guys of The Force Awakens would find themselves using the same dastardly sort of weapon they’d previously fought against. Alas, it was just a video game tie-in, and none of the rumors about Hux or the Resistance superweapon actually panned out. Not all these toy and movie rumors came about in our modern era of movie merchandising; here’s a fun one from all the way back in the ‘90s. 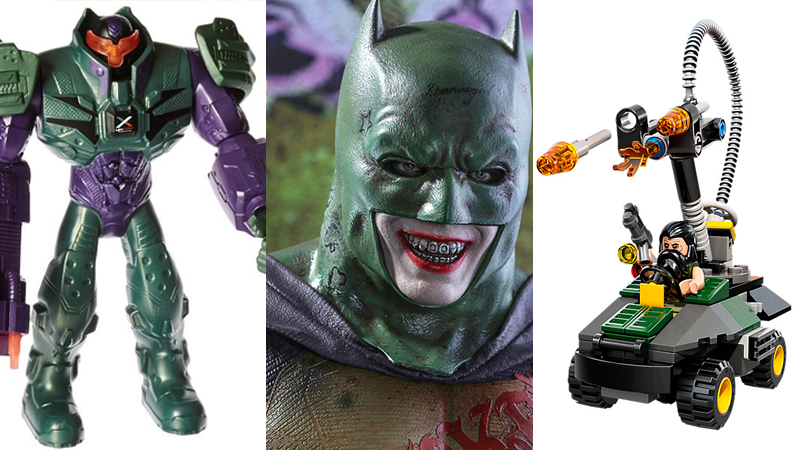 Tim Burton’s second Batman movie drew huge attention following the success of the first film, and with it, a much more extensive line of toys to go with the movie. Between the release of the first and second movies, DC Comics had also introduced the latest iteration of Robin the comics, Tim Drake, so to capitalize on the popularity of the new version of the boy wonder, Tim was included in the Batman Returns figure line, leading fans to believe that the new cinematic Batman would be getting his underage partner in crimefighting to join him in the sequel. Robin wouldn’t make an appearance in the movie, but the sidekick was planned to at one point. Marlon Wayans had been cast in the role, but was ultimately cut. Wesley Snipes has kept rumors alive about the resurgence of Blade in Marvel’s movieverse for years at this point, but over the past few years he’s renewed rumors of either a new movie or even a Netflix series in the wake of the streaming services successes with the Defenders. More intense speculation was renewed for Blade’s live-action return thanks to a recent Marvel Legends action figure included in a wave that also featured characters from Netflix’s Jessica Jones and Daredevil TV shows. Alas, it was just a comic-book version of the character included to pad the wave out, but that didn’t stop people from speculating that it obviously meant Blade was headed to Netflix. Honestly, this sort of thing happens a lot, all thanks to a movie’s toyline attempting to sell merchandise beyond the limits of the movie. Remember when everyone thought Darth Vader would appear in The Force Awakens because he had an action figure in the toyline? Or how James Gunn had to shut down rumors that the obscure cosmic comic character Darkhawk was in Guardians of the Galaxy Vol. 2, because he had an action figure in the movie’s toyline? Or how Gunn had to deny a similar rumor for the first movie too, when everyone freaked out that Tony Stark would be in the movie thanks to his action figure in the GotG line (complete with severed Groot leg)? The list goes on quite a bit, honestly. Guys, you just shouldn’t believe everything you read on toy packaging (or see on toy shelves in stores, for that matter). If the movie studios want to reveal a spoiler—and they seldom do—there are much, much better ways to do that than putting an action figure in plain sight in Target.